As many as 30,000 migrants every year are imprisoned in the UK’s detention centres. A system that imprisons people who have committed no crime, while the government decides what to do with them, is an affront to socialist Labour values of democracy, justice and freedom. What’s worse is that sexual abuse, racist violence and inadequate healthcare are rife, and compound the traumas that compelled many detainees to seek refuge here in the first place. The recent shocking revelation that 56% of detainees are suicidal, seriously ill or victims of torture – people who the Home Office’s own rules state should not normally be detained – and that 84% do not know how long they are being detained for, should be the final straw. We welcome Shadow Home Secretary Diane Abbott’s pledge that a Labour government would close two detention centres and end indefinite detention. We think our party should commit to, and campaign for, the closure of all of the UK’s migrant detention centres. 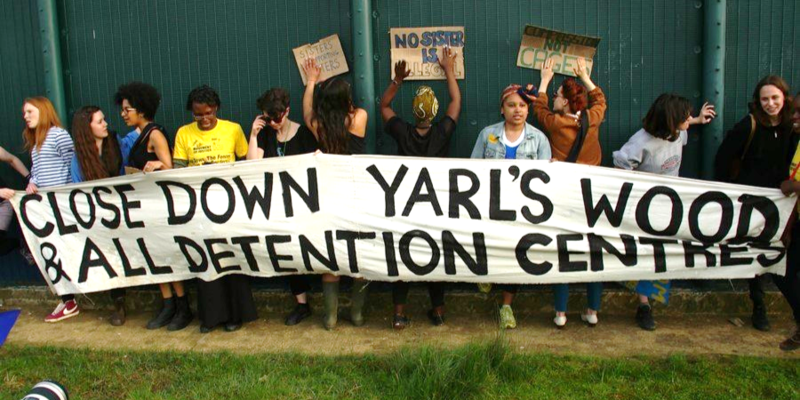 Join us to protest for the closure of detention centres at Yarls Wood on 1 December. Yarls Wood is a womens’ detention centre. There have been reports of gender-based and sexual violence and the healthcare inside is appalling. Earlier this year, the women inside went on hunger strike over inhumane conditions. Labour has pledged to close it. Find details, including coaches, by clicking here.